ARLINGTON, Texas - John Smoltz has found consistency this season only in his lament after he pitches. He is angry he gives up runs, but he directs that anger at the fates, not at himself. Smoltz grappled with the same emotion last night after a 6-3 loss to the Texas Rangers. What began as perhaps his best Red Sox start - five effortless, smooth innings - unraveled in an implosive, three-homer sixth inning. In Smoltz’s mind, the bottom line - six runs in 5 2/3 innings - did not jive with his self-evaluation. Smoltz’s five-start tenure with the Sox has produced only one win and a mountain of aggravation. He fell into the tempo and rhythm he wanted once the game began. His fastball lacked some zip, but he mixed his pitches well and kept the Rangers off balance. He allowed only four hits and one run, and carried a 2-1 lead into the sixth. Smoltz sensed his second Red Sox victory. He was not tired as the sixth began, and manager Terry Francona did not think he looked tired. “I would have taken him out,’’ Francona said. He hung a breaking ball to Michael Young, his nemesis on the night, and Young crunched a 424-foot home run to left-center field. Smoltz said the pitch was “horrible,’’ a hanging slider. But he still felt he could escape the inning tied. A double by Josh Hamilton and an RBI single by Hank Blalock dashed those hopes. Still, Smoltz trailed only by a run. When he struck out Marlon Byrd, he thought he would hand the offense a one-run deficit. 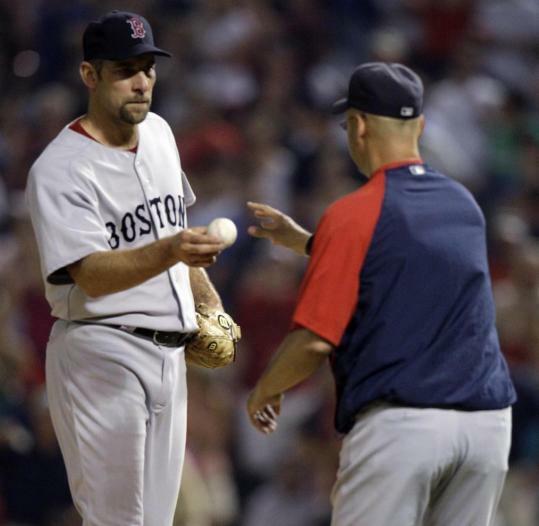 He worked a 1-and-2 count to David Murphy, and then, “I slipped,’’ Smoltz said. In the middle of his delivery, Smoltz fell off the mound while throwing a fastball. Instead of zipping over the outside of the plate, the pitch cut inside toward Murphy, only 89 miles per hour. Murphy golfed the pitch over the right-field fence, a “backbreaker,’’ Smoltz said. Jarrod Saltalamacchia followed with another home run, to center, and Smoltz’s once-promising night was over. One constant theme, and a prominent source of Smoltz’s frustration, has been runners scoring with two outs. Smoltz prides himself on finishing innings, but he has been most vulnerable when the end is one out away. Of the 18 runs Smoltz has allowed, 11 have come with two outs. Smoltz notched the wrong kind of milestone with his bitter end. He allowed three home runs in a game for the first time since June 8, 1997, and he surrendered three in one inning for the first time since June 19, 1994. Still, Smoltz held on to the belief he is throwing the ball well. He is 1-3 with a 6.31 ERA. His response is to shake his head and remain resolute. “I can’t go into the next start thinking that I’ve got to make wholesale changes,’’ Smoltz said. “I went into this game throwing the ball extremely well and didn’t come out with a good result.